This is the fourth article in my series about fundamental poker concepts. So far, I've talked about Expected Value, Odds and Position. The previous three are not well understood by everyone, but most seem to have some grasp about what's correct and when. However, a huge mistake made in poker is when people for some reason ignore the size of the pot. The size of the pot should be, with some very rare exceptions, the number one factor to determine how you act. 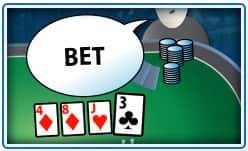 This ties into the article on pot odds, of course, as the size of the pot directly implies your pot odds, and pot odds in turn are one of the most important factors in determining expected value, which brings you to the core of poker: Making decisions with the highest expected value. Don't bluff into a small pot. Let's say you find yourself in a multi-way pot, at a limit hold'em table before the flop. It's you, the big blind and two limpers. You have two high cards, but the flop doesn't pair either of them. Everybody checks to you. Do you bet? I'd say no. With four people in the pot, chances are that someone has a pair. But if you're willing to risk a bluff, this may be a good time to do it. However, let's say you check to see if you'll have better luck on the turn. Turn comes, doesn't pair you, but everyone still checks to you. At this point, there are only 4.5 small bets in the pot. If you bet, you're hoping they'll all fold. You're paying two small bets (one big bet) to win 4.5 - but you risk being called again, or worse: Check-raised. This is not a winning move, because your potential gain is nowhere near big enough to cover the times when you're not ahead. Let's say that there's a 20% chance that you'll get away with your bluff and everyone folds (20%, which to me sounds pretty big) - someone might even fold bottom pair. How big does the pot have to be for that to be profitable? Pot size (x) times 1 time out of five must be equal to (or larger than) 1.6.
x * 1/5 = +1.6 => (gives) x = 1.6/(1/5) = 8 small bets. So if the chance is as big as 20% that ALL of your opponents will fold to your bet, the pot still needs to be 8 small bets for it to be profitable. If you deem the chance to be smaller, which it in reality probably often is, the pot needs to be even bigger. Note: This door swings both ways - if your opponents are aware of the pot size, they should of course be less inclined to fold to a bet into a big pot - they're often getting decent odds to draw. So, generally speaking: don't bluff into a small pot. For exactly the same reasons, be (a lot) less inclined to "keep people honest" if the pot is still small. Fold, even if you think your opponent is semi-bluffing (as a side note, this has to do with "Effective Odds," but that's a topic for another day). Take your chips to a different battle if the pot is still small. Seems obvious, doesn't it? Well, yes, it's nice to win big pots. But the key idea here is to maximize your chance of winning big pots. Let's look at some common scenarios where this comes into play. Don't fold on the river! A common piece of advice to novice players is to "look for reasons to lay your hand down," or "find the fold." These suggestions can be good advice, no doubt - but throw them out the window when the pot is big. With a big pot, you want to find an excuse to stay in! To give you an idea of what I'm talking about, I'll give an example. You're holding AK, you've come all the way to the river with nothing but over cards, and the pot has reached the impressive size of 16 big bets. How you got to the river with a huge pot with nothing but over cards is not important for the sake of this argument (if it makes you feel better, presume that you're at a table with maniacs and the pot was capped pre-flop, and you've been getting correct odds to try to hit over cards ever since). However it was, here you are, and the texture of the board is such that the flop offered a straight and a flush draw, but neither the turn or the river would have completed them. Your opponent has been betting the whole way, and it's just the two of you left, and he again bets out on the river. Should you fold? You have nothing. A measly pair of deuces has you beat. 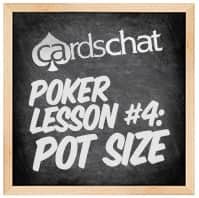 But with a pot this big - you're looking at 16 big bets that can be yours for the cost of 1 big bet - you have to be 94% certain that your opponent isn't just semi-bluffing. I'm rarely that certain of anything at the table. 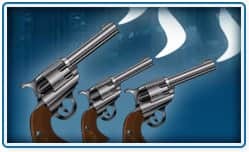 Conversely, if YOU are the guy who's been semi-bluffing on both the flop and the turn, and you have a cold caller, the river is no place to holster your guns and lie down to die. Remember, the other guy might be on draws, too, and chances are his hand will beat yours unimproved. Of course, if you bet, he might also be folding the worst hand, in which case you've gained nothing. For this reason, be more inclined to make this third move for the pot if your high card is not an ace. Let the days be gone where you semi-bluff on the flop and the turn, but chicken out and check on the river, only to find you're beaten by nothing but over cards. Remember: you don't need to win this every time to make it profitable - just once in awhile (just how often is dependent on the size of the pot, but knowing how to calculate expected value, you can do that math yourself). Let's look at the same scenario as in the first case, where you're holding only two high cards to the board, but you suspect that the guy betting is on a draw. Let's rewind it to the turn, and you have people left to speak behind you. Be more inclined to raise here! The players yet to speak behind you are much less likely to call two big bets on the turn, if they're holding just a pair. You might even get the original bettor to fold. Raising always gives you more ways to win the pot, and when the pot is big, you want to use every weapon in your arsenal. The idea here is that you suspect the players behind you have decent but not great hands, but that the player to your right who bet might be bluffing. Therefore, raising may isolate you with the one hand at the table you can beat. This is a line of play that is fairly rare at the lower limits, but that shouldn't stop anyone from employing it when it's correct. The idea is to be the person at the table who decides which odds the other players get, in order to encourage or discourage draws, depending on the strength of your own hand. It's also a play that's highly dependent on position - you more or less need to be in last position to make proper use of it. Let's say you hold pocket aces, and you raise two limpers pre-flop in last position. The big blind and both limpers come along to see the flop, which does not pair you, but does present a flush draw. It's checked to you - do you bet? Without risking more of your money, you get to find out if the turn brings a possible flush. If no scare card falls, you will likely induce a bet from a worse hand (like a top pair, but you have the aces), or even a bluff. If no flushcard hits the turn, you're there to raise! 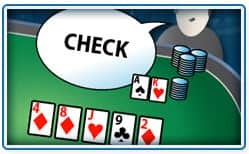 Someone who DOES have a flush draw, will often take the route of semi-bluffing the turn, and you can make him pay too much to see the last card. As always, you must remember to make your decisions consciously - don't act on a hunch. If you bet this flop, ask yourself why. As long as you can believe your own reasons for why you bet, it's correct. But betting or raising with a legitimate hand is usually done to get a better hand to fold or a worse hand to call. Clearly, a better hand than yours will not fold this flop, and worse hand than yours - that aren't getting proper odds to continue - won't call it. The only thing you gain from betting the flop is making the pot bigger the times you win it - which is a good reason, but I'll argue that that won't always be good enough. Poker is a situational game, however, and any reads you have on your opponents might sway your decision here. Either way, checking is not a play that you should immediately discard just because you believe your hand to be the best. In a similar situation like the one above, where instead of having an over pair to the board, you flopped a boat, there are reasons to bet. As was stated, any flush draw would still get proper odds to draw (not knowing that they're drawing dead). A case could be made for slow-playing this flop, hoping that someone else picks up a hand on the turn that they're willing to bet into you with, but with the pot already at 8.5 small bets, chances are they'll be willing to see the turn card with many hands. Also, by betting with a hand that's not afraid of cards to come, you're increasing the pot size before the turn, perhaps making a draw think that they should continue to the river even when the turn misses them and you bet out again. Betting in a situation like this is a play that the most novice of all players would make, of course. You don't need to be an expert to bet with the nuts - but realizing all the nuanced benefits to a play is important. There's another thing to be said about betting a monster hand in last position on the flop, instead of slow playing: Players are a lot more likely to believe you're just trying to use your positional advantage to steal. In fact, I'd bet some players would be more scared of your hand if you checked than if you bet! Slow playing and trapping is so common at the lower limits, that representing your hand is often the most deceptive play of all. Pot Size, Pot Size, Pot Size! 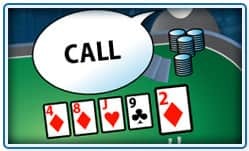 The next time you find yourself hesitating and wondering if you should call or fold (a hesitant decision that's usually made about 10 times per hour), have a look at the pot and let it make the decision for you. Big pot = call, small pot = fold. I think you'll be pleasantly surprised at the outcome.